Mathematics (colloquially, maths or math), is the body of knowledge centered on such concepts as quantity, structure, space, and change, and also the academic discipline that studies them. Benjamin Peirce called it "the science that draws necessary conclusions". Other practitioners of mathematics maintain that mathematics is the science of pattern, that mathematicians seek out patterns whether found in numbers, space, science, computers, imaginary abstractions, or elsewhere. Mathematicians explore such concepts, aiming to formulate new conjectures and establish their truth by rigorous deduction from appropriately chosen axioms and definitions. Through the use of abstraction and logical reasoning, mathematics evolved from counting, calculation, measurement, and the systematic study of the shapes and motions of physical objects. Knowledge and use of basic mathematics have always been an inherent and integral part of individual and group life. Refinements of the basic ideas are visible in mathematical texts originating in ancient Egypt, Mesopotamia, ancient India, ancient China, and ancient Greece. Rigorous arguments first appear in Euclid's Elements. The development continued in fitful bursts until the Renaissance period of the 16th century, when mathematical innovations interacted with new scientific discoveries, leading to an acceleration in research that continues to the present day. The apparent plural form in English, like the French plural form les mathématiques (and the less commonly used singular derivative la mathématique), goes back to the Latin neuter plural mathematica (Cicero), based on the Greek plural τα μαθηματικά (ta mathēmatiká), used by Aristotle, and meaning roughly "all things mathematical". In English, however, mathematics is a singular noun, often shortened to math in English-speaking North America and maths elsewhere. The evolution of mathematics might be seen as an ever-increasing series of abstractions, or alternatively an expansion of subject matter. The first abstraction was probably that of numbers. The realization that two apples and two oranges have something in common was a breakthrough in human thought. In addition to recognizing how to count physical objects, prehistoric peoples also recognized how to count abstract quantities, like time — days, seasons, years. Arithmetic (addition, subtraction, multiplication and division), naturally followed. Monolithic monuments testify to knowledge of geometry. Further steps need writing or some other system for recording numbers such as tallies or the knotted strings called quipu used by the Inca empire to store numerical data. Numeral systems have been many and diverse. From the beginnings of recorded history, the major disciplines within mathematics arose out of the need to do calculations relating to taxation and commerce, to understand the relationships among numbers, to measure land, and to predict astronomical events. These needs can be roughly related to the broad subdivision of mathematics, into the studies of quantity, structure, space, and change. In modern notation, simple expressions can describe complex concepts. This image is the graph of cos ( y arccos sin|x| + x arcsin cos|y| ). Most of the mathematical notation in use today was not invented until the 16th century. Before that, mathematics was written out in words, a painstaking process that limited mathematical discovery. Modern notation makes mathematics much easier for the professional, but beginners often find it daunting. It is extremely compressed: a few symbols contain a great deal of information. Like musical notation, modern mathematical notation has a strict syntax and encodes information that would be difficult to write in any other way. The opinions of mathematicians on this matter are varied. While some in applied mathematics feel that they are scientists, those in pure mathematics often feel that they are working in an area more akin to logic and that they are, hence, fundamentally philosophers. Many mathematicians feel that to call their area a science is to downplay the importance of its aesthetic side, and its history in the traditional seven liberal arts; others feel that to ignore its connection to the sciences is to turn a blind eye to the fact that the interface between mathematics and its applications in science and engineering has driven much development in mathematics. One way this difference of viewpoint plays out is in the philosophical debate as to whether mathematics is created (as in art) or discovered (as in science). It is common to see universities divided into sections that include a division of Science and Mathematics, indicating that the fields are seen as being allied but that they do not coincide. In practice, mathematicians are typically grouped with scientists at the gross level but separated at finer levels. This is one of many issues considered in the philosophy of mathematics. Mathematical awards are generally kept separate from their equivalents in science. The most prestigious award in mathematics is the Fields Medal, established in 1936 and now awarded every 4 years. It is often considered, misleadingly, the equivalent of science's Nobel Prizes. The Wolf Prize in Mathematics, instituted in 1979, recognizes lifetime achievement, and another major international award, the Abel Prize, was introduced in 2003. These are awarded for a particular body of work, which may be innovation, or resolution of an outstanding problem in an established field. A famous list of 23 such open problems, called "Hilbert's problems", was compiled in 1900 by German mathematician David Hilbert. This list achieved great celebrity among mathematicians, and at least nine of the problems have now been solved. A new list of seven important problems, titled the "Millennium Prize Problems", was published in 2000. Solution of each of these problems carries a $1 million reward, and only one (the Riemann hypothesis) is duplicated in Hilbert's problems. As noted above, the major disciplines within mathematics first arose out of the need to do calculations in commerce, to understand the relationships between numbers, to measure land, and to predict astronomical events. These four needs can be roughly related to the broad subdivision of mathematics into the study of quantity, structure, space, and change (i.e., arithmetic, algebra, geometry, and analysis). In addition to these main concerns, there are also subdivisions dedicated to exploring links from the heart of mathematics to other fields: to logic, to set theory (foundations), to the empirical mathematics of the various sciences (applied mathematics), and more recently to the rigorous study of uncertainty. The study of space originates with geometry - in particular, Euclidean geometry. Trigonometry combines space and numbers, and encompasses the well-known Pythagorean theorem. The modern study of space generalizes these ideas to include higher-dimensional geometry, non-Euclidean geometries (which play a central role in general relativity) and topology. Quantity and space both play a role in analytic geometry, differential geometry, and algebraic geometry. Within differential geometry are the concepts of fiber bundles and calculus on manifolds. Within algebraic geometry is the description of geometric objects as solution sets of polynomial equations, combining the concepts of quantity and space, and also the study of topological groups, which combine structure and space. Lie groups are used to study space, structure, and change. Topology in all its many ramifications may have been the greatest growth area in 20th century mathematics, and includes the long-standing Poincaré conjecture and the controversial four color theorem, whose only proof, by computer, has never been verified by a human. Understanding and describing change is a common theme in the natural sciences, and calculus was developed as a powerful tool to investigate it. Functions arise here, as a central concept describing a changing quantity. The rigorous study of real numbers and real-valued functions is known as real analysis, with complex analysis the equivalent field for the complex numbers. The Riemann hypothesis, one of the most fundamental open questions in mathematics, is drawn from complex analysis. Functional analysis focuses attention on (typically infinite-dimensional) spaces of functions. One of many applications of functional analysis is quantum mechanics. Many problems lead naturally to relationships between a quantity and its rate of change, and these are studied as differential equations. Many phenomena in nature can be described by dynamical systems; chaos theory makes precise the ways in which many of these systems exhibit unpredictable yet still deterministic behavior. As a relatively new field, discrete mathematics has a number of fundamental open problems. The most famous of these is the "P=NP?" problem, one of the Millennium Prize Problems. Mathematical concepts and theorems need not correspond to anything in the physical world. Insofar as a correspondence does exist, while mathematicians and physicists may select axioms and postulates that seem reasonable and intuitive, it is not necessary for the basic assumptions within an axiomatic system to be true in an empirical or physical sense. Thus, while most systems of axioms are derived from our perceptions and experiments, they are not dependent on them. Nevertheless, mathematics remains extremely useful for solving real-world problems. This fact led Eugene Wigner to write an essay, The Unreasonable Effectiveness of Mathematics in the Natural Sciences. ^ Steen, L.A. (April 29, 1988). The Science of Patterns. Science, 240: 611–616. and summarized at Association for Supervision and Curriculum Development. ^ See false proof for simple examples of what can go wrong in a formal proof. The history of the Four Color Theorem contains examples of false proofs accepted by other mathematicians. ^ Ivars Peterson, The Mathematical Tourist, Freeman, 1988, ISBN 0-7167-1953-3. p. 4 "A few complain that the computer program can't be verified properly," (in reference to the Haken-Apple proof of the Four Color Theorem). ^ Einstein, p. 28. The quote is Einstein's answer to the question: "how can it be that mathematics, being after all a product of human thought which is independent of experience, is so admirably appropriate to the objects of reality?" He, too, is concerned with The Unreasonable Effectiveness of Mathematics in the Natural Sciences. Davis, Philip J. and Hersh, Reuben, The Mathematical Experience. Mariner Books; Reprint edition (January 14, 1999). ISBN 0-395-92968-7.— A gentle introduction to the world of mathematics. Gullberg, Jan, Mathematics—From the Birth of Numbers. W. W. Norton & Company; 1st edition (October 1997). ISBN 0-393-04002-X. — An encyclopedic overview of mathematics presented in clear, simple language. Monastyrsky, Michael (2001). "Some Trends in Modern Mathematics and the Fields Medal". Canadian Mathematical Society. Retrieved on 2006-07-28. Popper, Karl R. (1995). "On knowledge", In Search of a Better World: Lectures and Essays from Thirty Years. Routledge. ISBN 0-415-13548-6. Riehm, Carl (August 2002). "The Early History of the Fields Medal". Notices of the AMS 49 (7): 778-782. Sevryuk, Mikhail B. (January 2006). "Book Reviews" (PDF). Bulletin of the American Mathematical Society 43 (1): 101-109. Retrieved on 2006-06-24. Waltershausen, Wolfgang Sartorius von (1856, repr. 1965). 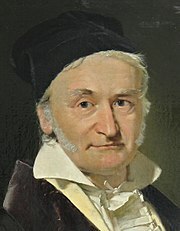 Gauss zum Gedächtniss. Sändig Reprint Verlag H. R. Wohlwend. ISBN 3-253-01702-8. Ziman, J.M., F.R.S. (1968). "Public Knowledge:An essay concerning the social dimension of science". Online Encyclopaedia of Mathematics  from Springer. Graduate-level reference work with over 8,000 entries, illuminating nearly 50,000 notions in mathematics. Planet Math. An online mathematics encyclopedia under construction, focusing on modern mathematics. Uses the GFDL, allowing article exchange with Wikipedia. Uses TeX markup. This page was last modified on 23 August 2009, at 01:58.